Today I’m posting about pet peeves in the science lab. Who doesn’t have some of those? And, yeah, we are all probably guilty at one time or another of driving other people a bit nuts with our own idiosyncrasies that are their pet peeves. 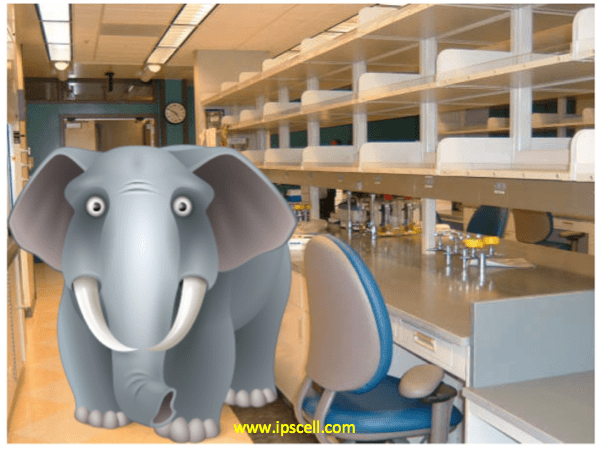 This post is another in my “Elephant in the Lab” series about difficult, but important science topics. We need to discuss these, but they are often uncomfortable so it sets up a tension. The goal of this series is to catalyze discussion and have some fun doing it. On to the pet peeves. I know there are a lot more pet peeves out there in science so please share your pet peeves in the comments. The damn empty tube. You go into the fridge or freezer to get that key reagent for your already-started or otherwise urgent experiment and there sits the dreaded empty tube. @#$&^@#$. You spin it, but still empty. To the one who used the last of this reagent, re-order it or ask someone else to at the very least. The junkyard bench. There’s this person at the bench next to you who you might nickname “Pig Pen” from the comic strip Peanuts. So messy that the mess sometimes landslides onto your bench. Admittedly, when I was a trainee my bench was almost never immaculate, but not quite this bad. The talker. Blah blah blah blah blah…endlessly in the lab. Sure, it’s cool to have friendly lab mates and chat, but this one literally never ever stops talking. Ever. Another version of this one is the noisy labmate. They hum all day. They play the drums with pipettes. They clear their throat every five minutes…forever. This happened to me when I was a trainee. It’s more than a tad distracting. The golden one. They get Cell, Science, and Nature papers. Their experiments always work. The PI loves them to pieces. How do they do it? You don’t know, but somehow it’s just not fair. Damn it. The perturbed lab bench. You go home at 7PM and when you come back the next morning, your lab bench is not quite the same. You can just sense it. Stuff has been moved around. Pipettors are not in the same place? Stuff missing? Something seems really wrong. Was someone using your lab bench? Or is it just paranoia? The lone wolf. Yeah, everyone in the lab has their own work to do and career and life to think about, but this person is in it just for themselves to an extreme. They generally do not share reagents, work cooperatively (e.g. help out changing each other’s media on cells over the weekend), or help out labmates with protocols or advice. The mysterious breaker. Okay, I know this equipment was working yesterday and now today it isn’t. I need to use it. Who is the one who broke it? Nobody? Grrr. Who screwed up the pH meter? Who cracked the objective on the microscope? The messed up lab shared area. Clean up the chemical bench and don’t leave powder all over the balance. Clean up the gel area. Clean up your crap in the sink. If you spill on the floor, clean it up. Are you in kindergarten? The out of touch PI. The last time you talked to your PI was…..hmm, when was that? In the hallway 6 months ago? Questions are accumulating…where the heck is my PI? The hoarder. Do you really need those LB amp plates with mushrooming colonies and fungus from 2007? That mystery solution that is changing color? The 5,000 epitubes on your bench and in the freezer taking up every rack in the lab? Every Bunsen burner sparker in the lab on your bench? All the 500ml beakers? It’s like a squirrel stowing away acorns for the winter. When I was a postdoc our cold room got pretty disgusting at times. Usually I was not too bad about keeping stuff, although at times I did find some old LB plates of mine with colorful bacteria and fungi growing on them. But when I did, I promptly tossed them. I visited my graduate school lab 10 years after I left. My bottles of culture medium were still in the cold room…enshrined, perhaps!